The degrees of the Lodge of Perfection (4-14th) have been either exemplified or communicated to our Fall Reunion class. I want to thank all of the brethren who participated in the degrees. This includes the casts, the degree directors, those that provided the valuable assistance in setting up the stages for the various scenes in our degrees and to Brother Bob Rowan for his outstanding audio/visual and overall production for the degrees. Also, thanks to Ill Daniel Doornbos for his excellent work in the communication of the degrees not exemplified. I received many favorable comments from the class as to the messages of our degrees and the manner in which they were presented. In the 12th Degree, The Master Architect, the Venerable Master reveals to the class, with the aid of the Senior and Junior Wardens, the instruments made use of by the master architect. I thought it would be interesting and useful to briefly review the tools and the lessons they teach us. intended to benefit and bless us. The Slide Rule – teaches us that we should strive to grasp and solve the great problems presented by the universe and involved in our existence, to know and understand the lofty truths of philosophy and to communicate freely our knowledge to others. The Parallel Ruler – teaches us that we should be consistent, firm, unwavering and of that equanimity of mind and temper which befits a mason. The Plane Scale – teaches us that should not only live for ourselves, but for others, so as in just measure to serve ourselves, our families, our friends, our neighbors and our country. The Different Compasses – teaches us that life and time are but a point in the center of infinity, while the circle of God’s attributes are infinite. The Protractor – teaches us that we should be upright and sincere in all our dealings, moderate in our professions, and exact and punctual in performance. I hope you can join us on November 13 for our monthly stated meeting and dinner. 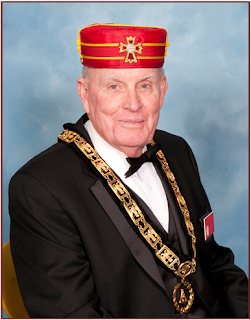 During the dinner activities, we will hold the “capping ceremony” for our newest Scottish Rite brothers. Come and shake their hands and share this proud moment with them. This will be an excellent opportunity to put your own Plane Scale to good use. For all my Masonic brothers and their loved ones I wish a Happy Thanksgiving.